In 1938, President Franklin Delano Roosevelt founded the March of Dimes. That year Howard Hughes set a record by flying an airplane for 91 hours around he world. It was the same year as Douglas “Wrong Way” Corrigan landed in Ireland after allegedly trying to fly to California claiming navigation problems. Roosevelt launched a $5 billion spending program (roughly $78 billion in 2008 money) to try to stimulate the economy after the Recession of 1937. The US also established minimum wage laws. The radio adaptation of H.G. Wells’s The War of the Worlds broadcast by Orson Welles causes panic, especially in the northeast. The New York Yankees beat the Chicago Cubs 4-0 in the 1938 World Series and the New York Giants defeated the Green Bay Packers in the 1938 NFL championship game. Seabiscuit beat War Admiral in the “Match of the Century” at Pimlico in Baltimore. 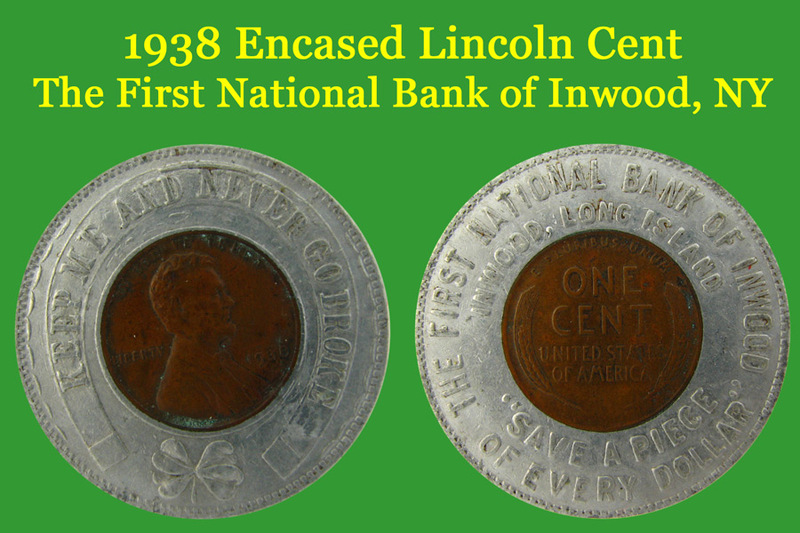 In 1938, the First National Bank of Inwood on Long Island produced an encased Lincoln Cent to advertise the bank. What few records exist suggest that it was common for banks to create 100 to 500 of these encased cents distributed to customer and potential customers in the Inwood community. This one has survived 70 years intact. The First National Bank of Inwood (FNBI) was founded in 1923, the same year Yankee Stadium opened with a Babe Ruth home run. It was founded by former members of Bank of Manhattan to take advantage of the migration to the suburbs as new immigrants started to move into the areas of New York City. FNBI was able to survive the Great Depression through good management and extending good will to the community. FNBI was the first bank on Long Island to offer drive-through teller windows in 1950. FNBI eventually merged with Franklin National Bank (formerly Franklin Square National Bank) in 1954. During the 1960s, a Belgium bank consortium working with a German bank consortium bought Franklin National Bank in 1968 to form European-American National Bank—rename European-American Bank (EAB) in 1972. EAB was a fixture on Long Island until Citigroup purchased the bank in 2001. Inwood is one of the Five Towns along with Lawrence, Cedahurst, Woodmere, and Hewlett. The Five Towns are located in the southwest corner of Nassau County, near the Far Rockaway, Queens border. My parents move their young family to Inwood in 1965 so that their oldest son (me) would not go to the failing New York City Public Schools. As I reflect on my youth in Inwood through the long lens of time, I have fond memories of the good times. So when I find a numismatic souvenir of Inwood, regardless of when it is from, it has to become part of my collection.